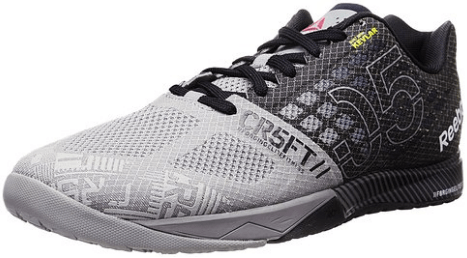 The R Crossfit Nano 5 hit the market in March of 2015 and has racked up increased popularity ever since. With over 850+ reviews on Amazon it’s no wonder this shoe is rocking the trainer charts still in 2018. At the time of writing, this shoe has 4.5 stars to its name which is very impressive, showing it can really stand the test of time. Surely over 850 people can’t be wrong? Here is how I came about trying this shoe out. Not only were these shoes remarkably stylish but it seemed that some of the guys I really respected in the classes swore by them. Comfort struck a striking cord with me and I knew I had to try them out for myself. So what makes these shoes so great, you may be asking? Let’s start with some of the fundamentals you expect when buying a new pair of trainers. Durability – They contain a strong Rubber sole which makes these synthetic shoes extremely durable due to their unique design and well maintained support structure. Fit – As with Reebok’s other models, these shoes will seamlessly fit your foot in a way you could never imagine. Over 75% of users have claimed that the size they purchased fit as expected. Considering the amount of people who have purchased these amasses into the thousands, I consider this a positive. I’m typically a size 9 and that’s what I ordered. They couldn’t fit any better. To say I’m a fan of these shoes is an understatement. Prevents Injury – With the newly built in nanoshell mid-sole you can rest assured these will provide the protection you require. More importantly the re-engineered design of the shoe prevents injury in particular during various lateral movements of your foot. This means strenuous exercises shouldn’t be a problem. They stand the test of time in quality and provide your foot with a comforting support that will withstand heavy lifts. Trustworthy brand – Reebok, the company behind the shoe are clearly a household name and sponsor many major sporting events. What this means for you is you can rest assured that you will be receiving an order that delivers on quality, durability and most importantly price. Perfect for cross fit or other strenuous exercise. Before I delve into the relevant questions you may want answered in our FAQ below, let me finalise by telling you my overall experience. These shoes expelled brilliance from the outset. Having purchased them on Amazon they were fulfilled and ready for use with 3 days of buying. As excited as I was to bring them to my first class I was even happier to avail of the free shipping that came with my order! The most difficult part for me was deciding which of the 23 different colors I wanted. I’m not usually one to be picky but they all looked great! If you’re interested in knowing I purchased the flat grey black option. They were exactly as the pictures described. Update: I have since bought a second pair of these shoes in the cycle blue color, another awesome option. Q. Will these shoes suit someone with wide feet? A. This is an important question to ask when you’re in the market for new shoes. The answer is yes they will. Many others are in this situation and have recommended that these shoes are remarkably comfortable even when you have wide feet. Q. If I was to use these shoes for jumping would they be ideal? A. Absolutely, these were made for crossfit and part of these exercises includes jumping. Due to their durable nature and design the support should see you through jumping and in fact help to prevent injury. Q. Does the shoe run small or big? A. No the shoe typically fits well for most users, however the toe area can run slightly wide. On Amazon over 75% of users claimed that these shoes fit as described. Then again keep in mind people have different requirements. Q. Would these be ideal for lifting weights? A. Yes these are perfect for lifting weights. So if you’re doing deadlifts, squats etc you’ll find these a comfortable and efficient buy. Due to the harder sole they can withstand the impact, meaning you’re less prone to picking up injuries. Q. Can these work well in the gym? A.. Whether its cross fit or gym activity there’s no doubt that these shoes will perform well. Many customers have highly recommended these as the “go to shoes” for gym use. Q. Would these work for water sports? A. If you’re looking for shoes for water sports, I’d highly recommend these. They can be used for cross training and in the water also. Another solid option that I can’t but recommend. Q. What is the average length of time that these last? Q. Where can I purchase these shoes? A. For the best price we highly recommend buying from Amazon.com as they provide a quality service to customer. In addition to this, you will be eligible for free delivery and have the opportunity to select from 23 different colors in the Reebok range. Most importantly, you can check out the thorough reviews on their site to make sure your purchase is the right one for you.